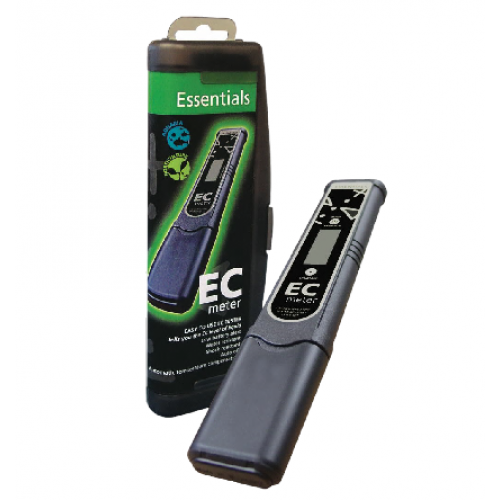 The Essentials Digital EC Meter is a highly effective handheld nutrient meter to assist you with mixing your nutrient solution by providing quick and accurate readings that measure the strength of dissolved nutrients within your solution. This hard-wearing tool is water and shock resistant to avoid any accidents if the meter is dropped into the solution and will stay afloat until you can retrieve it to avoid internal electrical damage. Simply switch on the Essentials Digital EC meter and submerge the sensor in your nutrient solution for approximately 20 seconds to obtain an accurate reading from the digital display. For best results you should regularly calibrate your meter and clean the sensor after each use. Essentials CF Standard is used to calibrate CF/EC meters.It is important to realise that unless you ..
Waterproof materialSimplistic design with no buttons or switchesProvides readings in CF, EC, ppm 500..